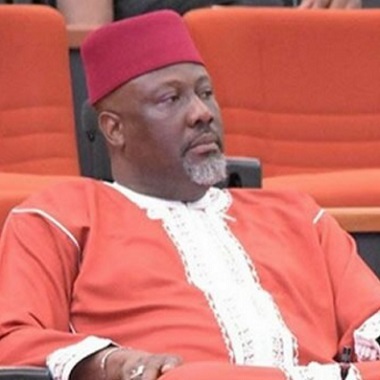 Multiple The certificate scandals rocking Senator Dino Melaye, representing Kogi has finally attracted the attention of the Vice Chancellor of the University of Abuja, Prof. Michael Adikwu. Dino Melaye had also claimed he earned a degree from University of Abuja aside the Ahmadu Bello University's and several other degree now questionable. Meanwhile, The certificate forgery scandal rocking the senator representing Kogi West Senatorial District, Dino Melaye took a messy dimension on SUNDAY as fresh report according to Punch Newspaper suggests his name is not on the Ahmadu Bello University alumni website. Sahara Reporters, an online news medium, has claimed the senator did not graduate from ABU for his first degree. a claim Melaye has rebuffed vehemently, saying he authentically obtained his B.A. in Geography from the institution. His name, Daniel Jonah Melaye, as it appeared on a statement of result by the university, when searched, returned with zero result. According to to Punch Newspaper, when it searched for ‘Daniel,’ ‘Jonah’ and ‘Melaye’ separately, different names came up. A search for ‘Melaye’ brought up only one result: Melaye Sunday Ola (Biology Education), who graduated in 1980. Another search for ‘Jonah’ came up with four different names: Bawa Jonah Seth Besanhi (BSc Geography; graduated in 1973); Birga Jonah (BSc Geography; graduated in 2007); Kaigama Jonah Ishaku (BSc Geography; graduated in 2011); and Ndasala Jonah (BSc Geography; graduate in 1987). There were 10 results when ‘Daniel’ was searched: Abin Daniel John (BSc Geography; graduated in 1978); Adamu Kantsan Daniel (Institute Of Education Geography; graduated in 1992); Aniro Daniel Rabo (BSc Geography; no graduation date indicated); Atenji Daniel E. (BSc Geography; graduated in 1986); Beshiru Daniel (BSc Geography; graduated in 1980); Dada Daniel Adefila (BSc Geography; graduated in 1979); Awubra Daniel Akinkwe (Geography; graduated in 2002/2003); Daniel Bosede Biddy (BSc Geography graduated in 1983); Daniel Dogara Garba (BSc Geography; graduated in 2010); and Daniel Ezra Jatau (BSc Geography; graduated in 2011). When our correspondent called the ABU Public Relations Officer, Mr. Adamu Mohammed, about 8pm on Saturday to find out why the senator’s name was not on the alumni website, his line rang out. On the second trial, the line was switched off. A text message also sent to his mobile line on the matter had yet to be replied to as of press time. When SUNDAY PUNCH contacted the President, ABU Alumni Association, Prof. Ahmed Tijanni-Mora, he said only the university could confirm if Melaye graduated from the institution. Last week, ABU’s spokesman, Mohammed, when contacted by The PUNCH promised that the institution would come out with its position on Wednesday, which it failed to do as of the time of filing this report. Saturday PUNCH’s March 25 edition had obtained a document which revealed that the senator got a statement of result with the logo of ABU. The statement, issued by the Office of the Registrar, Academic Office, was dated February 3, 2000, and signed by B.B. Mshelthlila. It was, however, observed that while the statement of result had the name “Daniel Jonah MELAYE”, the senator’s National Youth Service Corps discharge certificate, which was issued on July 8, 2001, read “Melaye Daniel;” his diploma certificate issued by the University of Jos on August 3, 2006 read “Daniel Dino Melaye”, and his Senior School Certificate in 1992 read ‘Melaiye Daniel Jonah O’ with Melaye being wrongly spelt. Similarly, the University of Abuja, which Melaye claimed he had also attended, refused to comment on whether the senator obtained a master’s degree from the institution. The Vice Chancellor of UNIABUJA, Prof. Michael Adikwu, responding to an inquiry by one of our correspondents on Saturday, said, “Issues of certificates should be directed to the registry. I heard that (allegation against Dino Melaye) also, but I will find out later.